“If one reads the messages on the Sai Baba News Forum, posted by close devotees and Sai Baba students, it’s very clear from them that around the 4th April – and again around the 20th April – there was major upheaval; and Sai Baba was believed to be dead. It’s fairly obvious that during these 15 days the Sathya Sai Central Trust was grappling with the inner finances control affairs and trying to keep the news covered over. 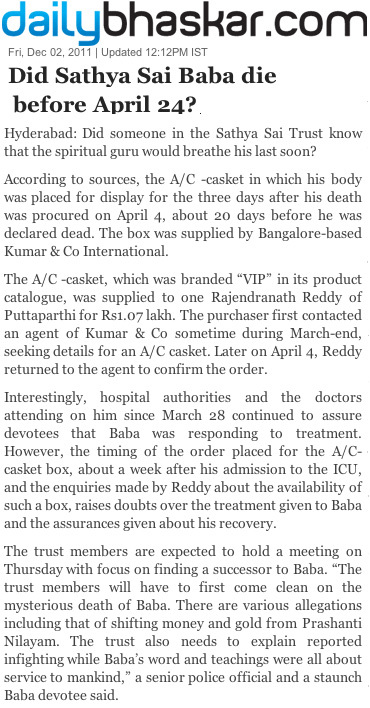 But from most of the direct news from Puttaparthi (as reported by close Sai-devotees/students) and from the sequence of medical bulletins, between April 4th to April 20th, The Central Trust maintained the same “stable, but critical and vital parameters nearly normal” announcements. By mid April the “final news” had spread everywhere, so top politicians, top medical experts were flown in, the “sanjeeva samadhi” (burial while alive) news came in by 20th. The Seva Dal (Sai Baba’s own service organization at Prashanthi Nilayam) actually reported that Sai Baba’s body had finally stopped functioning by 3.30pm April 20th. The choice of an “Easter announcement” is suspicious. The supposed death day Easter Sunday (when Christ is believed to have resurrected from death!) knowing how the Trust people believe (in their mistaken ‘true belief’ and chauvinism) that many Christians are (or may become) very sympathetic towards Sai Baba (and a source of possible future donations). Even perhaps because it was India’s national icon and cricket superstar Sachin Tendulkar’s birthday fell on April 24th and, him being a devotee, the Trust could thereby milk a great amount of positive and sympathetic media attention . This entry was posted on April 28, 2011 at 1:29 pm	and is filed under Sathya Sai Baba, Sathya Sai Central Trust. You can follow any responses to this entry through the RSS 2.0 feed. You can skip to the end and leave a response. Pinging is currently not allowed. Here is awfully humiliating and shocking news of ruthless violation of secularism, dishonouring our National Flag by our Indian Government and politicians mocking the Preamble of our Constitution. The Preamble to the Constitution of India declares that India is a secular state and the term secularism in constitution refers to the governmental practice of indifference towards religion which is an attempt to prevent religious philosophies or bodies from influencing governmental policies. We gravely feel that secular character of our Indian democracy is now under serious threat. It was a shameful day for our nation! We strongly condemn the disgraceful attitude of the government of India, the Governors of Andhra Pradesh and Rajasthan, Chief Ministers of Andhra Pradesh and Maharashtra, all ministers and politicians who were solely responsible for this offensive event sponsored by the state and those top political leaders, ministers, bureaucrats, military officers, business tycoons and celebrities who witnessed the funeral of Sathya Sai baba, a Hindu Fundamentalist and Spiritual Fraud. Let us stand together to save our Secular Humanism and to remonstrate on blatant violation of secularism of our constitution, all kind of superstitions, supernaturalism and fundamentalism. Please strongly condemn and protest against the fanatic role of Indian Government, ministers and political leaders for unashamedly violating secularist thought of our Indian Constitution and provoking Hindu fundamentalism. Condemn the appalling and provocative role of a large section of News Media who have been propagating superstitions and blind faith on so-called “supernatural” or “divine power” in credulous common people making an “Avatar” or god-man image of the spiritual fraudster Sathya Sai Baba after his demise. Therefore, we request all press media to stop manufacturing a “god-man” or a great “humanist” image of Sathya Sai Baba who was nothing but a fake “Mahatma”, a spiritual cheat, a pervert disguised in saffron garment and a notorious criminal backed by the corrupted politicians, ministers, rich merchants, big industrialists and mafia in reality. We implore to all media persons not to publish any trash “hocus-pocus” reports gossiped by Sai Baba’s devotees and disciples without proper investigation or any kind of news applauding this cheat “Baba” as a revered “humanist” as these will unquestionably create a wrong impression of your reputed news media. Please raise your voice of protest to eradicate all kind of superstitious beliefs, unscientific notion and anti-secular activities regrettably practiced by our political personalities and celebrities.